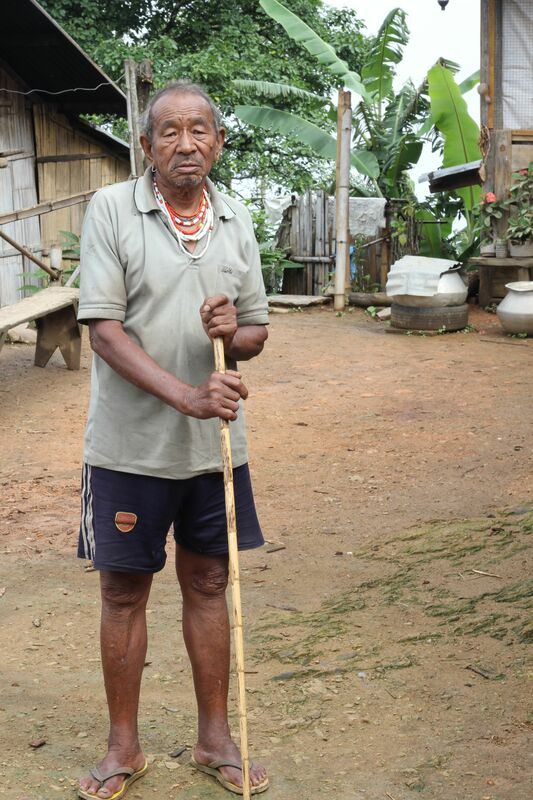 Military hidden in the jungle, check point registration, machine guns pointed at us, nigh impassable roads, spear carrying tattooed elders yet a warm, friendly, generous and proud culture. Such was our experience of the situation in Nagaland. 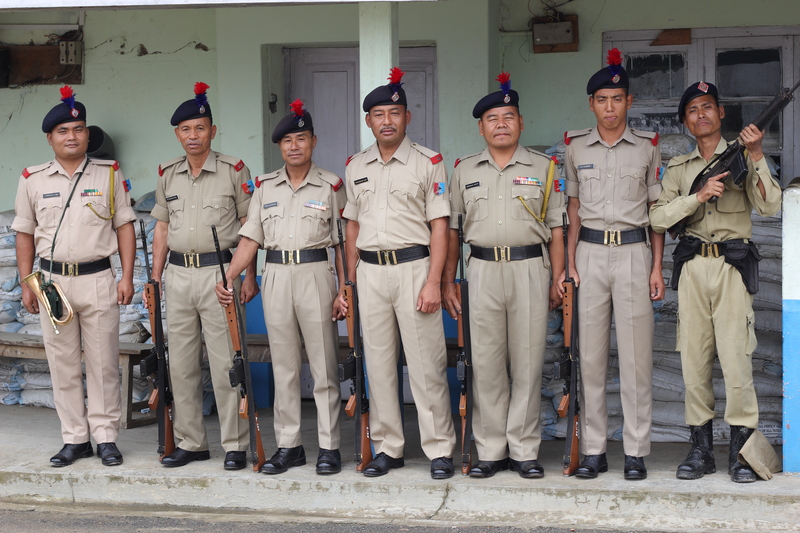 Policemen in Kohima happy to be photographed. We had to register our presence! The Sister States are not historically part of India and there has been an ongoing struggle for Independence. And when travelling in Manipur and Nagaland we certainly did not feel like we were in India at all. The states have a very different culture and an ancient one which they are struggling to preserve. 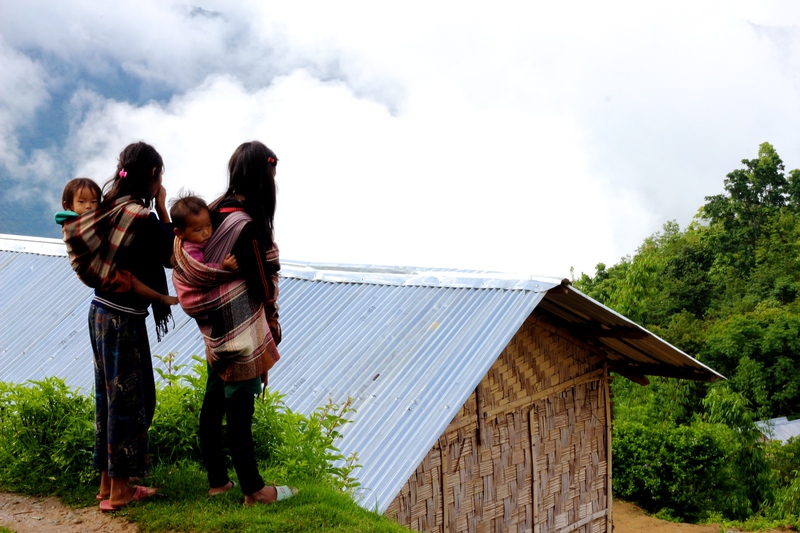 Locals talk of a resurgence in ancient practices and culture and Nagaland hill tribes bear witness to that. We took ourselves onto another ‘loop’, this time on the recommendation of a local who has cycled the breadth of India; a real Naga! “This road will take you to villages where they have never seen foreigners. Local tourists don’t even travel this route. 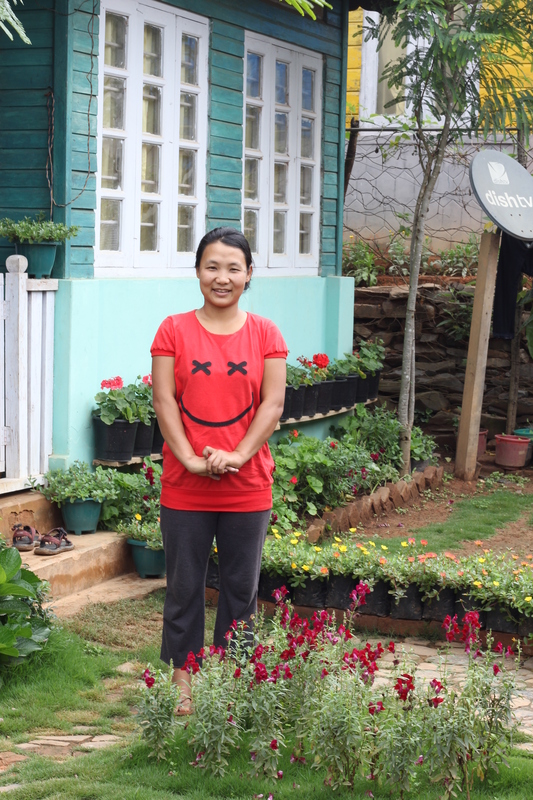 You will see the real Nagaland.” After a lovely breakfast made by our local friend, we took off from Kohima, the capital of Nagaland, towards Meluri where he had prearranged a home stay for us. At the risk of sounding like we are becoming fixated on bad road conditions (because we are! ), I won’t preach about the roads too much, but let me say they were nearly impassable in the wet. They would be difficult work in the dry, but we experienced true off-road 4WD conditions for three days. We climbed to an altitude of 2100m above the clouds and in the clouds. Fortunately, the route wound around the ridges rather than over them, so the gradient was kind to us. Muddy waterfalls gushed onto the road, puddles were deeper than my foot pegs, bridges were flooded and a landslide blocked our way. There is no wonder tourists don’t visit here! We were treated to the occasional vista of mountain ranges and virgin jungle as we wound our way around the ridge lines. Drop offs below us looked bottomless, but my eyes stayed on the muddy way before me. Along the way, there was a sign boasting of the highest village in Nagaland, so we thought we would drop in and have a ‘cuppa’. Down we dropped steeply into the village, passing by wooden houses with rooflines resembling buffalo horns under which were messy conglomerates of very large ‘ mitun’ (buffalo) horns nailed over the doorways. All of a sudden, on a corner of the road against a backdrop of an amazing vista of mountains, stood a tattooed red cloaked man holding a spear! My research showed that the headhunters were not supposed to be in existence anymore! 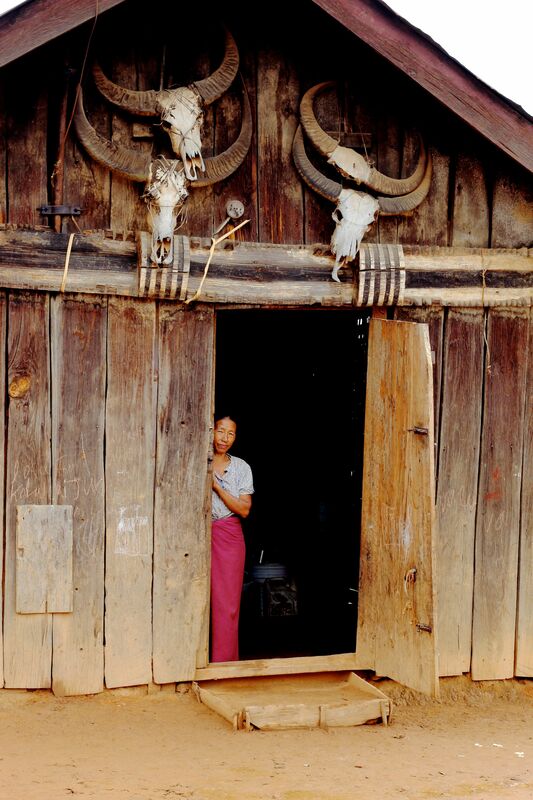 Hurriedly, we rode past him, still looking for a Rice Hotel until we reached a dead end and a courtyard of these incredible wooden houses and horned doorways. We weren’t sure we should be here! So up we went again, climbing back to the main road without finding any shops. Now that is the real Nagaland! Traditional dress, tattoos and spears! Upon reaching Meluri, we waited at the bus stop in a deluge, trying to make phone contact with Rebekah, our home stay hostess, but there was no phone coverage. At times like this, I wonder what we are trying to achieve on this trip. Torrential rain, no common language and seemingly no accommodation. However, we also know something always eventuates for us. Dressed in our stylish rain gear we waited for that ‘something’. A young man soon appeared under an umbrella and beckoned us to follow him. Up the muddy, narrow lane ways we lugged our panniers to a piece of sunshine; a beautifully painted weatherboard house, complete with floorboards and a tiny well kept garden of colourful flowers. It felt like we had found a gingerbread house in the dark forest! With what seemed a click of our heels, we had a lovely traditional curry dinner cooked over Rebekah’s earthen wood fire. The hospitality we experienced at this little home stay was incredibly warm. It left me wanting to bunker down there and wait until the monsoon was over. That night, as we worked on the logistics of the next part of our route, Rebekah, her sister and I sat on the bed under candlelight estimating riding times and where we might spend the next few nights. They asked me many questions about my life in Australia and she expressed how she would never be able to afford to travel like we do. She asked if my Government was sponsoring us – I wish! We also talked about food and our favourite dishes. When I said I ate beef, she said, ‘I will cook some for you tomorrow!’. And yes, the next morning she was up early to the market to buy some beef! 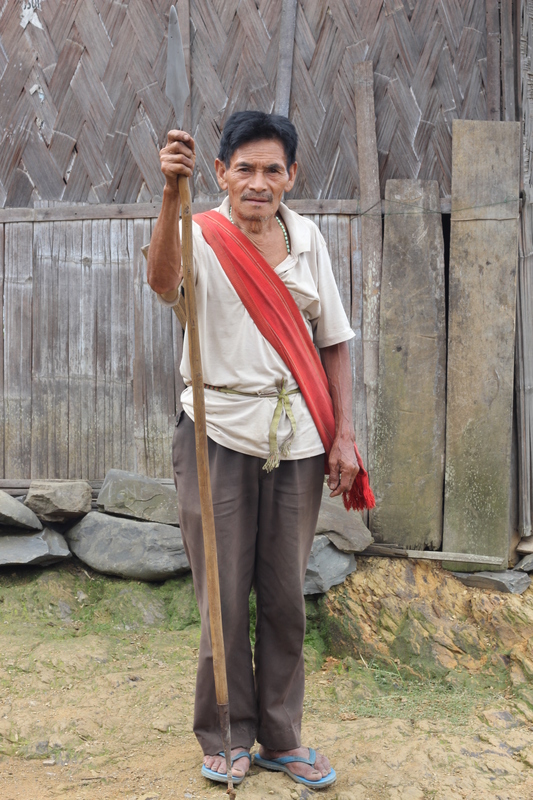 Having planned only a short distance for the next day, we eagerly agreed to go on a morning walking tour of the Naga village. A young man was enlisted to guide us whilst Rebekah cooked up the beef curry for us. The village was alive with men and women heading off to the fields for the day, for their lives rely on them having enough food to sustain them. Their economy is based upon food trade and little else. Again we met spear carrying men with tattoos. 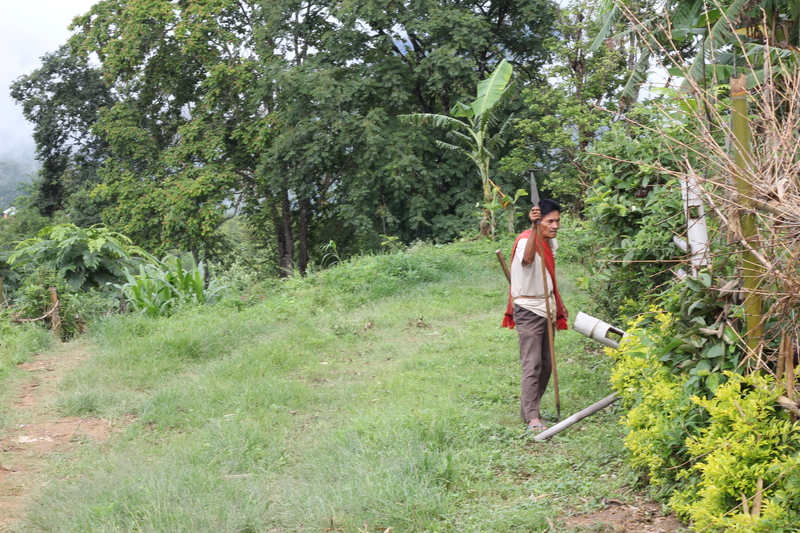 Our young guide said that the men carried spears to protect themselves from tigers, bears and wild boar! Apparently there are still plenty of boar in the jungle, but not many tigers or bears. But having seen tiger teeth and bear feet for sale in Myanmar, I know that poaching and hunting are still very much alive, although outlawed in Nagaland, but not Myanmar. The steel pointed spears also had a matching steel tip on the other end, which seemed to operate as a walking stick. The young people of the village dress in modern clothes, but the old people of the village are still proudly holding on to their traditions. Their clothes are handwoven and in traditional colours. 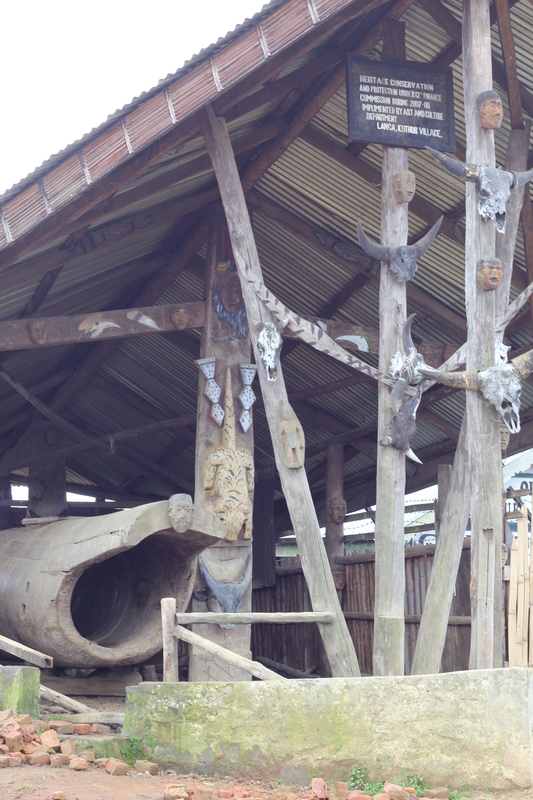 They display the totems of the buffalo horns, dogs and the crescent moon in their architecture and clothes. Headhunting was practised only two generations ago! Tigers, bears and wild boar? I constantly wonder how it is that these countries with such a history of warfare and civil unrest can be populated by such warm and welcoming people. 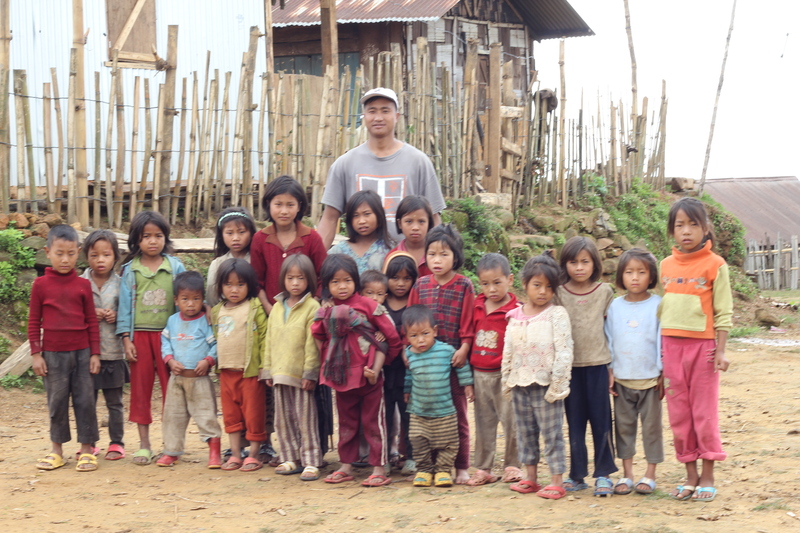 Our cyclist friend from Kohima believes that in countries where governments can not be relied upon to fairly and equitably help the people, then the people must join together in strong communities to help each other. People make time for each other and they especially make time for us, visitors to their land. This warm experience continued into the next day. We decided to push on to Tuengsang having consulted a local policeman in Phifre on the road conditions. “Sure the roads are good”, he said. The roads were not good, in fact they were abysmal, boggy washouts and the monsoons were unrelenting. Upon dusk we were still 8 kms away from Tuengsang and facing a dark, soggy ride. I made a stand. “No way i am riding in the dark on this road. It is just too dangerous. Someone has to put us up in this village,” I emphasised. Atop the mountains, a large Church is always the first sign we are nearing a village and Kuchur village was no exception. We were guided to the church where we parked and locked up our bikes and were greeted by the pastor of the Baptist Church. He was incredibly warm and said we were welcome to stay with his family. Such relief! Before Myanmar, we had never had to ride into the night and now we seem plagued by night riding. The pastor and his wife, along with a new baby and a 2 year old, were very gracious hosts who ensured we had lots of hearty food, hot water and a warm fire to warm ourselves by. “Take more rice,” they kept urging. “You need it for your ride.” They both spoke very good English and were locals who had devoted their lives to the Ministry. This hospitality was true Christianity. They gave freely, made us feel very welcome and would not even take a donation of money. “It wouldn’t be right,” Pastor George said. 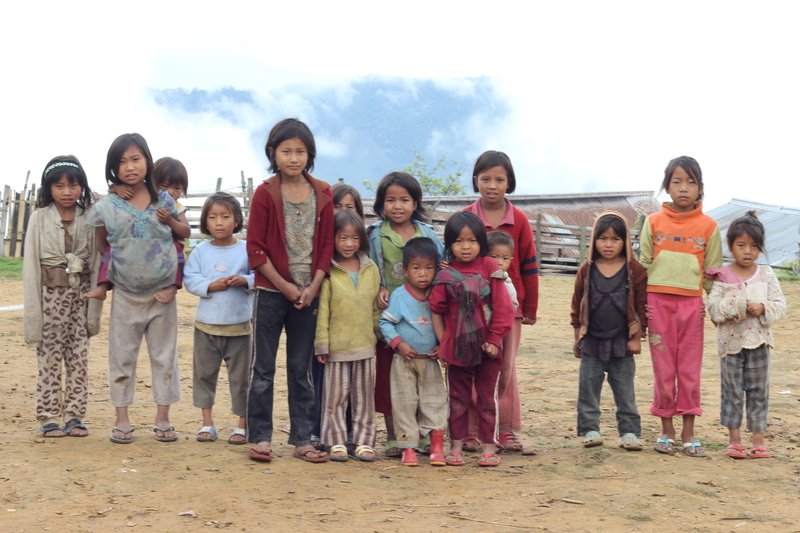 But next, a village tour in the morning before heading off to finish our loop through Nagaland. 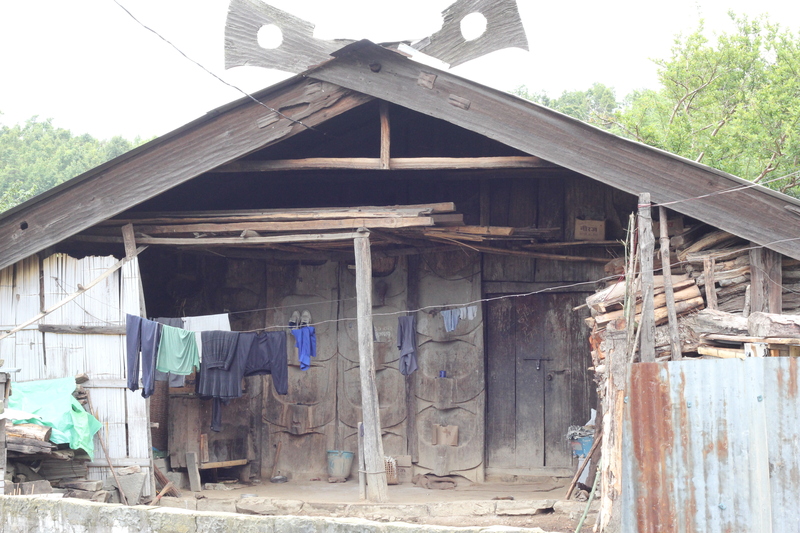 Again, a unique doorway into the traditional lifestyles of the Nagas. 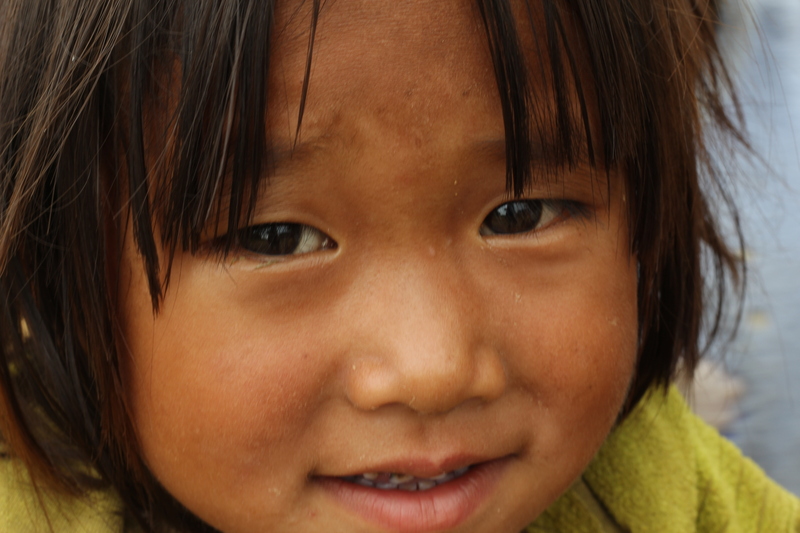 Unfortunately, though amidst the warmth of the people, there was a dark side to our trip through Nagaland. You see, there was “a situation”, as it was called by the locals. Upon entering Nagaland, we were told to register at the Kohima Police station and that we did. In Imphal, Manipur, we were subjected to a hotel room check by police and we expected to see less military the further we penetrated the jungle. We were wrong. It got worse the further we penetrated Nagaland. Army personnel were situated at random and regular corners, seemingly in the middle of the jungle. Trucks with machine guns pointing out of the roof were plentiful. Most often we were halted in the jungle. ‘What is your purpose?”, was the standard question. Tourism seems to be beyond comprehension to them. A drug sniffing, growling dog was set upon my top box at one of these mandatory stops. As a boom gate was opened from above us one day, I looked up to see the operator also had a machine gun pointed in our direction. Memorably, as we rounded a corner with Con ahead of me, three startled soldiers had all three guns pointed at Con. All of the villages we passed through seemed to have security police, some uniformed and some not. Every time we stopped for a Chai in a village, an English speaking well dressed man would come and introduce himself to us and ask us our business. 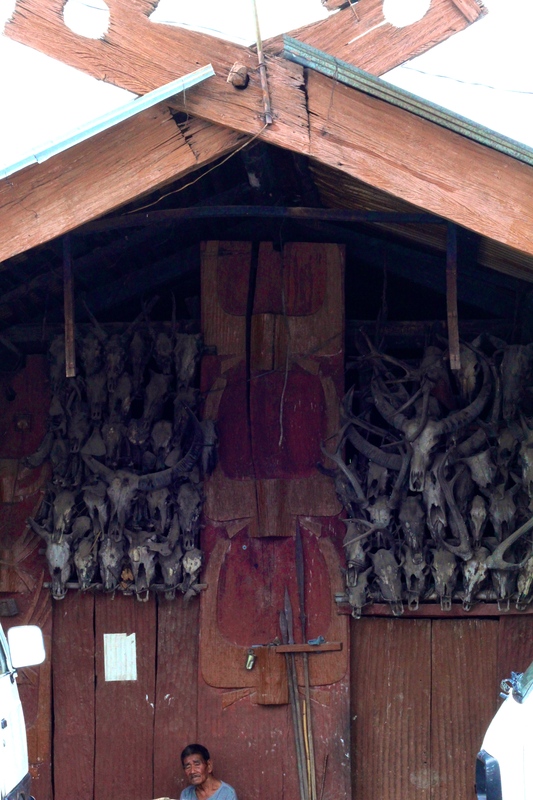 At first, we mistook this as a local welcome, but it wasn’t, it was a security check. It became blatant when one of them began videoing us in the Tea House. I do not know if this level of security is normal, it is hard to know. The “situation” was that just a few days before we arrived from Myanmar, a group of insurgents had ambushed a group of Indian soldiers on amain road and killed them. Such was the reason the army seemed to be on high alert. There is a long history of the Sister States wanting Independence from India and over the years this has erupted periodically. We had experienced an unusual situation of unrest. I do not know the truth of what was happening, but I do know what we experienced, hence what the local people live with; overbearing security, guns, guns and more guns. I would like to emphasise though, these soldiers are very human. With a wave and a bit of humour, all was well. Let us not forget they are young and a family’s child. Tomorrow ‘the situation’ may not be there, but it was for us.